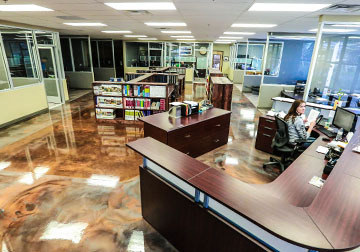 Capital Commercial Flooring, Inc (CCF) was established in November of 1993 and is locally owned and operated. Located in Sacramento, CA, CCF has established itself as a reputable commercial flooring company that services the Northern California region. We strive to satisfy the end user’s needs with a vast array of commercial products that meet and exceed industry standards. Our knowledge and expertise sets us apart from the competition. With over 30 years of hands-on technical experience, our staff is able to offer a number of different product solutions that will be suitable for the end user - with budget, practicality, design, sophistication, and the environment all in mind. We will also assess and mitigate risks that are common in the flooring industry in order to protect the financial investment of the project owner. We pride ourselves in having completed a number of landmark projects in the Sacramento region (to see completed projects click here). These projects stand as a testament to our commitment to our region.